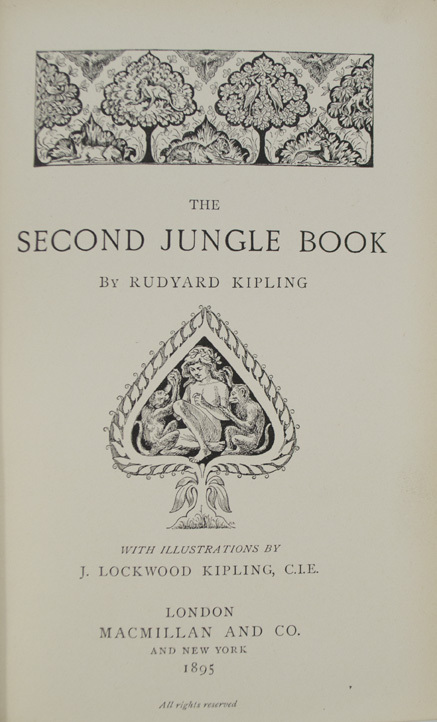 KIPLING, Rudyard. Jungle Book [And:] The Second Jungle Book. London: Macmillan and Co. , 1894. First edition. Small octavo. (7 1/4 x 4 3/4 inches; 181 x 120 mm). [vi], , 212 pp. With frontispiece and tissue guard. Numerous illustrations, including many full-page illustrations, included in pagination. 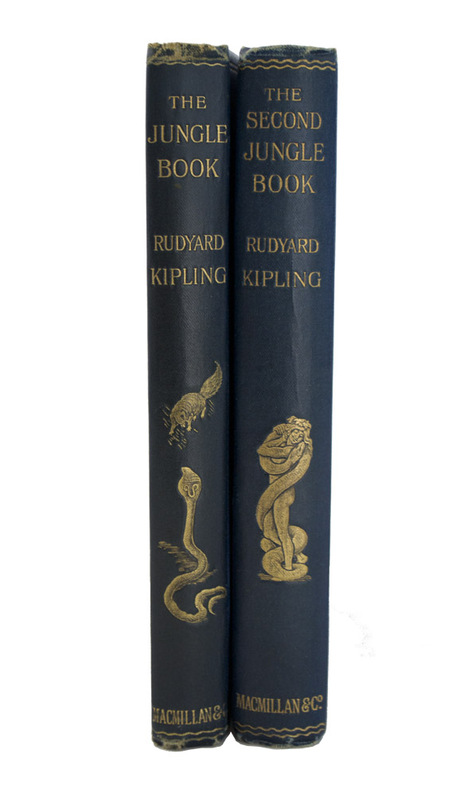 KIPLING, Rudyard. The Second Jungle Book. 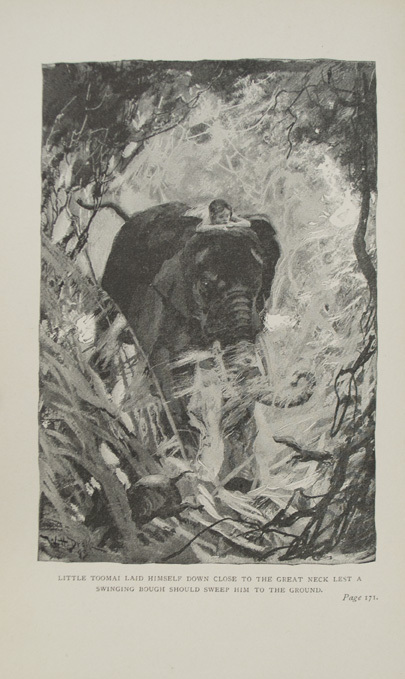 With illustrations by J. Lockwood Kipling. London: Macmillan and Co., 1895. First edition. Small octavo. ( 7 1/4 x 4 3/4 inches; 181 x 120 mm). [vi], 238, [2, ads] pp. Numerous illustrations, including many full-page illustrations, included in pagination. Title-page with vignette illustrations. With two pages of publisher's advertisements. Two volumes. Original bright blue cloth decoratively stamped in gilt on front covers and spines and lettered in gilt on spines. 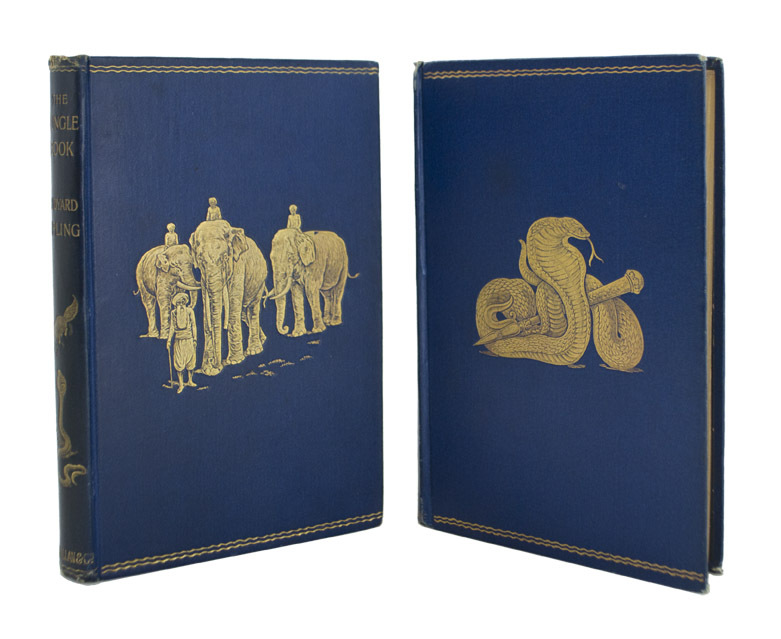 Volume one with elephants stamped in gilt on front cover and a gilt cobra on the spine. Volume II with a cobra in gilt on front cover and a man and snake in gilt on the spine. All edges gilt. Original dark blue-green coated endpapers. Previous owner's old ink signature on front free endpaper of volume one. Extremities of the spines and corners with a bit of rubbing. Overall a very nice set. 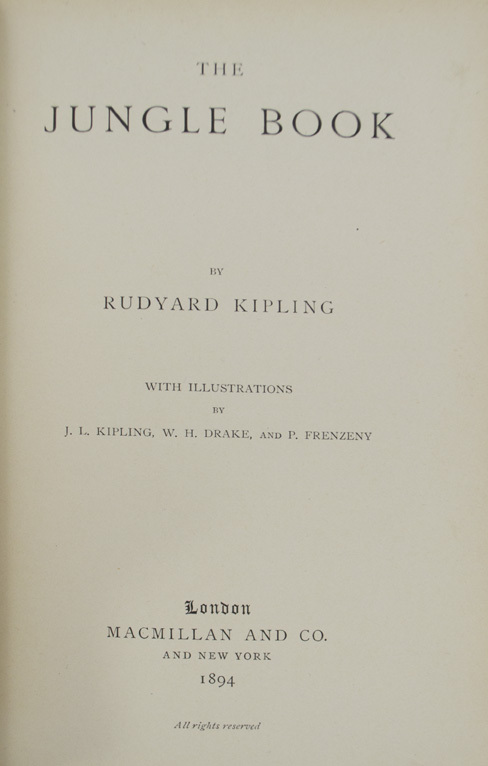 Rudyard Kipling has been called "perhaps the most original genius among English-writing novelists of the latter 19th and early 20th centuries." Certainly no other has been so widely acclaimed, so eagerly read, so lastingly loved by readers on both sides of the Atlantic. The honors bestowed upon him all over the world were capped in 1907 when he was awarded the Nobel Prize for Literature. Livingston 104 and 116. Martindell 61 and 63. Stewart 123 and 132.